Scared of pie crusts? This easy biscuit crust is perfect for beginners. For even more flavor, try it with the optional Italian sausage! August 2016 update: This is one of my most popular summer recipes, which men seem to especially love. Click here to read a sampling of rave reviews from the comments section. Thanks so much to all of you who take the time to come back and report on my recipes. And thanks for pinning them on Pinterest too! Sometimes it's good to be alone in the kitchen. That way, when you pull a pie like this out of the oven and are standing there staring at it while it cools on the counter, mouth watering, stomach rumbling, fingers twitching, you don't have to worry about losing control and getting your hand slapped because you can't resist it. You can simply tear off a piece of that warm, golden crust and pop it into your mouth and nobody will ever know, because pieces of crust break off pies all the time. Of course if you end up nibbling off five or six inches around the edge, you're going to have to come up with a good explanation as to why it is missing. Pets can be quite handy for this. If the pie is just for you, then you'll be forced to face the fact that you just gobbled up the very best part off a large portion of your pie. This recipe is actually a combination of four things that I love. The first is homemade pizza. The second is homemade Pecorino Romano crackers, which I don't make very often because my hunky farmguy Joe doesn't care for them so I have to eat them all myself, and I have no self-control when they're around. I've had entire meals that consisted of nothing but these crackers. The third thing is a similar pie I've made with tomatoes, cheddar cheese and fresh basil using a recipe from a 1998 issue of Country Home magazine. And the fourth thing is something I invented on a whim years ago when I had my little bakery cafe in Northern California. It was basically a free form calzone made with a biscuit-type crust and filled with sliced Roma tomatoes, mozzarella cheese, and pesto. I called them pesto piezones, and each one was about the size of both of my hands put together with my fingers spread apart. I sold them for four dollars apiece, and they were usually all spoken for well before lunchtime. Until the other day I'd forgotten all about them. Now this may look like a pie, and I may even be calling it a pie, but it's really not a pie. So those of you who are afraid of pies can keep reading. And now I'm going to say this again in a slightly different way because people who are afraid of making pies have often been tricked into making them and then suffered traumatic experiences: This is not a pie crust. It's made with a biscuit dough, but, for those of you who are afraid of making biscuits, it is not actually made from biscuits. This dough is easy to work with. This pie is quick and easy to make. That—for anyone who is still suspicious—means that this is by no means a difficult culinary endeavor. You can make this pie. Yes, you. And when you do, if you decide to share it, it will most likely make whomever you feed it to immediately smile with delight and love you even more than they already do. And you certainly can't beat that. Purchased pesto works fine in this recipe, but if you have 20 minutes to spare and can get your hands on some beautiful fresh basil, I say make your own. Use your favorite pesto recipe or try mine below. It calls for roasted and salted almonds instead of pine nuts, less olive oil than most pesto recipes, and fresh tomatoes, which give the pesto a subtle new flavor while replacing some of the olive oil and making it thin enough to be spreadable. You can save time by making the pesto a day or two ahead. Or you can make the entire pie ahead of time and simply reheat it in the oven. Individual leftover slices can be wrapped in foil and reheated in the oven or toaster oven, although it isn't too bad cold either. If you are very, very gentle, you can heat a slice in the microwave. What I like most about this recipe is that although the tomatoes are cooked, they manage to maintain their fresh-from-the-garden taste. Yes, I've gone from Summer in a Bowl to summer in a crust. I like to use the meaty plum tomatoes, sometimes called paste or Roma tomatoes (although Roma is actually a specific variety of plum tomato), as 'regular' tomatoes may be too juicy and could make your pie soggy. "Any tomato that's suitable for a sandwich would, I imagine, be good in this pie. The crust is the key thing though, because the biscuit nature of it (rather than flaky pastry) makes it sturdier for the purposes of holding in all that tomato goodness. I also tend to make my pesto a bit on the drier side. And it helps to slice the tomatoes and let them sit on paper towels for a few minutes to leech out a tiny bit of juice." And Molly reported that, "I didn't have the plum tomatoes, but I just seeded and drained the ones that had grown last week, and it was delightful." Finny also adds crumbled and cooked Italian sausage to her pies. How brilliant is that? If you want to try adding some, too, you'll find my easy recipe for homemade Italian sausage here (no casings required! ), and there are helpful step-by-step photos of Finny's version of this pie here (warning: Finny uses bad words). Don't let the lengthy instructions scare you away. This really is an easy recipe and everything comes together quickly. When portioning out basil (and so many other ingredients), it works best if you weigh it rather than pack it into measuring cups. A digital kitchen scale is such a useful investment that once you have one, you may wonder how you ever lived without it. I often use my Oxo 11-pound kitchen scale several times a day. In the bowl of a food processor,use the S-blade to whiz the almonds and garlic until finely chopped. With the motor running running, slowly drizzle the olive oil through the chute. Salt to taste and add more olive oil if desired. Store your pesto in the refrigerator for several days or freeze it. A light coating of olive oil over the top of the pesto will help keep it from discoloring. Combine the flour, baking powder, and salt in a medium bowl. Mix in the butter using a pastry blender, fork, or your fingers until the largest pieces are pea-size. Stir in the Pecorino Romano. Pour in the milk and use a fork to gently form a soft dough. Do not overmix. Divide the dough in two pieces, making one slightly larger than the other. On a generously floured surface, use a rolling pin to gently roll out the larger piece of dough into a circle about 12 inches across, rolling from the center outward. Sprinkle dough with flour if sticky. Gently fold the dough in half and transfer into a 9-inch pie pan. If the dough tears, simply press it back together with your fingers. Roll out the remaining piece of dough into a slightly smaller circle and set aside (or wait until you have the filling in the pan and then roll it out). Using a spoon, spread 1/2 cup of pesto over the bottom layer of dough in the pie pan. Layer about half of the tomatoes over the pesto. (If you're adding the Italian sausage, layer half of it over the tomatoes here.) Cover the tomatoes with about 2/3 of the mozzarella. Layer on the rest of the tomatoes (you may not need them all to fill the pan). Carefully spread the remaining 1/2 cup of pesto over the tomatoes. (Add the other half of the Italian sausage here.) Cover with the remaining mozzarella and the Pecorino Romano. Roll out the second piece of dough if you haven't already, and carefully place it over the pie. Fold the edge of the bottom piece over the top piece and press together to seal. Use your fingers to make a crimped design around the edge. If any dough falls apart, simply press it back together with your fingers. Don't worry if it isn't perfect. The handmade look has much more charm. Cut four slits in the top of the pie for steam to escape. Bake at 375° in the center of the oven until the crust is golden brown, about 40 minutes. Cover the edge with foil if it starts to brown too quickly. Let cool on a wire rack for at least 15 minutes before serving. Crust edges may be sampled much sooner. (As with nearly any fruit pie, if you cut into it while it's still warm, some juice will seep out. If you plan to store any leftover pie right in the pan, simply drain off the juice so the bottom crust doesn't become soggy.) Or cool pie completely, cover, and refrigerate. You can also freeze this pie. I wrapped a hunk in foil then put it in a zipper freezer bag and tossed it into the freezer. I defrosted the whole piece overnight in the refrigerator, then cut it in half and reheated the slices in my little toaster convection oven for 15-20 minutes at 325°, each on a fresh piece of foil and covered lightly with the foil so the tops wouldn't brown too quickly. The bottom crust was a little soggy, but I'm pretty sure that was because I let the pie sit in the fridge three days before deciding to freeze it. Otherwise it looked and tasted as if it had just come out of the oven the first time. Hint: If you plan to freeze the entire pie and don't want to freeze it in the pan, use a disposable pie pan or line your pan with a piece of heavy duty foil so you can simply lift the whole cooled pie out of the pan. —Use arugula pesto or spinach pesto instead of basil pesto. —Omit the Pecorino Romano from the crust, and use cilantro pesto (thinned with salsa, if desired) and jalapeno jack cheese in place of the basil pesto and mozzarella. © FarmgirlFare.com, the totally tomato foodie farm blog where Farmgirl Susan shares recipes, stories, and photos from her crazy country life on 240 remote Missouri acres. Oh my gosh!!! That looks soooooo good. I'm wondering if my DH can make the crust in the bread machine.... I'll have to go back and read more carefully. The picture totally grabbed my tummy and took me away. You have the neatest ideas!!! I'm sure that no one has ever told you that! LOL!!! I "can" do this!!! Oh, it sounds so delicious!!! I do have fresh basil growing in the garden, so that will be easy. We love pinenuts and that is how I usually make my pesto, but almonds will be nice, too. Farmgirl, thanks so much for sharing your life with me. You have enriched me and made me look at my own piece of nature in a totally different way. Love from Texas, the really "warm" state. Congratulations, you succeeded in not eating all the crust before taking the photo!! This looks absolutely delicious.A great concept- you're very clever! I think I want to make some with eggplant in it, too. It will bet a bit more trouble, as the eggplant slices will have to be cooked first, but it's a combination I'm craving at the moment. I am going to make this! I have so many 'maters and basil, and it sounds like heaven! I'm excited to tell you my other news. In the next few years, I'm going to become your protegé and be French Farm Girl! We are set to inhert a house with 8 acres. I already asked Dh if we can have chickens and goats, he said no, but you know that once our baby is a kid, he/she will want animals and daddy will not be able to say no. hahaha, especially if mom brings a little lamb home...and yes, I will walk my lamb to the post office, just like you! You are my inspiration! 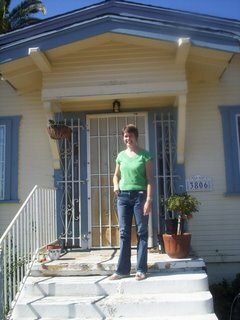 The plan is to open a bed and breakfast out of it after we do about 3 years of work on the house! I think it will be a life project. Can't wait to garden as well as knock walls down. Woohoo, compost heap, here I come. I agree with Bev -- that photo is borderline bad.. really really bad.. its got the "reach up and slap me I am starving" bad to it look. My mouth is overflowing with drool.... and I just got in from work and that looks like it would make a perfect breakfast if only I could magically make it appear on a plate for me. Alas, I don't have what I need to make that delish pie -- but will keep it in mind when I am able to figure out my "chaos" and grow a garden hopefully next spring! PS Please post Oatmeal toasting bread, your crackers.. and whatever other handy recipes you have not gotten around to yet. Everyone here still loves your Pitas -- even more so when they dont puff -- PIZZA! Yum! Just curious, what do you think the results would be if you made this with whole wheat flour? The white flour is the only thing here that's not on south Beach and it sounds fabulous? I'm not a baker so I don't have much experience substituting ww flour for white. More baking powder? Or would it just not work at all? Oh you're evil... I'd make this and eat the whole thing. Hello- I have been reading your blog for awhile now, I love the articles and the photos and your new kitchen blog is great! My partner and I have a farm in southern minnesota, heart of Amish country for about 2 1/2 years now. Your site is an inspiration... we hope to move from minneapolis to the farm ( Wren Hill farm) very soon- looking at jobs. I was interested in your further thoughts on the Sonoma diet. I am trying to lose about 30 lbs and have very little luck with any diet and so many use bad food, toxic looking food. I did lose on a low carb diet ( South Beach) but of course it all came back, not a lifestyle I could maintain. I know you're not a Doc but I repect your thoughts, so, can you post that review? I would also love to read your thoughts on food, health and staying in shape- maybe on your kitchen site? I know when I am at our farm I move more, eat better (fresher) and tend to lose- my sittin city life tends to keep packin it on! Thanks for your blogs- I'll be checking back in. I know it sounds weird, but I don't want the full responsibility for a farm YET. So I work as part of a team on a work to earn farm. I spend four hours there every weekend and get a full week of groceries, correction a week full of protein, the other veggies I need come from my garden. Instead doing boring exercise, you could work out a contract with a local farmer, from anywhere from an hour a week to a full eight hour shift. It doubles as fresh food and as a full body work out. Please, will somebody get this woman a publishing contract! !Finally, somebody who has made me want to bake a pie and not tremble at the thought of it all going hideously wrong. Salivating at the picture too. Save a piece for Cary. that pie looks wonderful!! i might just have to give it a try! Looks like a winner, Farmgirl! Hello- again- just thinking that some of the folks here might want to check out "Simply in Season" a great cookbook too, local, seasonal foods. Anyone read it? Oh YUM! That looks lovely! If I nudge you will you post the pecorino cracker recipe? That sounds good too. I used to make these little handpies, calzones also about the size of a hand, East Coast style with linguica and kale. Why I don't do it now, I don't know. But you've nudged ME back into the kitchen. Thanks, Farmgirl! ... what are some of the symptoms of becoming a foodie? I fear I am beginning to develop them. Please, do tell! That looks Oh My God! good. OH that looks SO good. I just found your blog yesterday and already added you to my favorites :) I even mentioned you in my post this morning. That looks so incredibly yummy! And like something I could actually make. I may have to make a trip to the grocery store! Susan, we've just finished eating that splendid meal. You would have been delighted to hear my man's ravings with each bite he took. Not only is this tasty beyond reason, it's also open to many variations: the dough is simply perfect and can accomodate any wild inspirations. Woo another one of your recipies I have to try.. I still haven't tried the scones yet but when I do I will report back. Have you any good recipies for Quiche/Savoury Flan? I'll add to the chorus of yumms and gotta make that now! I did have a question for anyone who might have an answer: do you think this would freeze OK? I thought maybe before baking. I've got lot of produce to use up and if I ate everything I'd be up more pounds than I'd like. If I could find another way to put away the tastes of summer, I'd be very happy! Thanks. I urge you all to listen to Farmgirl about the baking powder! She gave me excellent advice about this and was 100% correct. I cant wait to make this pie for my tomato loving husband. I made Chocolate Cake Emergency this weekend and was very very glad I did! Thank you again and again for these wonderful recipes! this is making my mouth water. seriously. i have basil plants at home that are crying out to be in such a great pie!! 2. I suppose that means I don't need to fix that picture, huh? oh yeah, 3. want me to post the infamous oatmeal toasting bread recipe??? pie = one word: "Stunning"
Mamacita! Thank you for putting up this recipe! I was wracking my brain for something to make for our dinner party* (using this term extremely loosely) this weekend and now I have my answer. Who WOULDN'T love this? (Answer: Nobody I want to have at my dinner party, that's who. )Served with a green fresh-from-the-rebirthed-garden salad and a great wine, this is going to be a huge hit. I'll post photos of this fine piece of non-biscuit, non-pie, all-good fare when I make it up. I made the pie last night. Having never made pie crust, I can vouch that the crust is easy to make and is sublime. I was so afraid of overworking the dough that when I pulled it out of the bowl to roll, it was still pretty crumbly but came together just fine. Turned out light, flaky, and delicious. We ate it again for lunch this afternoon. It was splendid. I am sad that it is all gone. Wow! I can't wait to try this -gorgeous! It sounds fantastic and looks great. I found your blog a few days ago. I like it. Also your garden and farm. Or should I say Edem's Farm? I made the scones a couple of weeks ago, by the way. They were REALLY easy to make and tasted like I'd been at it all day. That's the way we like it, right? Hi Susan - I posted about this dish on my blog - but someone asked me for a link and I notice you didn't post a permalink. Would you mind doing so? It would make the recipe a lot easier to find. Thanks!! I made this last night and my fiance and I loved it. I want to say how much I have been enjoying your Web sites since I started reading them a couple of months ago. I'm 26 and my fiance and I are first-time homeowners, so this summer I've discovered the joy of gardening, just started out with tomatoes, basil and some flowers and hostas, but I've learned more from your site than from any of the books I've checked out of the library. I'm also enjoying cooking in a normal-size kitchen, and now that I have a dishwasher, am much more adventurous with the recipes I choose. This one was a great confidence-booster, because the crust was truly easy, and it was just so satisfying and cheesey and good, and didn't leave you with any of that over-salted dried-out feeling you get after you eat pizza or calzones in a restaurant! Absolutely DELISH!!! Pretty easy to construct and oh so worth it! I made it for my family over Labor Day weekend and everyone loved it! The aroma while baking was mouth-watering and the taste was simply divine! Thanks for such a great recipe. I've recently found your website and love it!!! I've read your blog for a few months now, but somehow never managed to see this recipe. I saw it earlier this week and was practically drooling! It combines ALL of my favorites and I couldn't wait to try it. Well, I made it for dinner tonight and it is right up there with one of the best things to emerge from my oven - ever!! Thank you! I'm an aspiring bread maker and once it cools off a bit, I'm looking forward to following some of your wonderful recipes and tips to hopefully improve my homemade bread. Ohmygoodness this is amazing! I made it on a whim last night because I had people coming over for dinner and it was too warm (87 in Vermont in late Sept!) to make my planned potato curry. This came together fast and gorgeous as promised, and was more filling than expected. My two big carnivorous guy friends loved it and were full after one piece! NOTES: I used (good local organic) storebought pesto and would do so again, but with the no-salt version next time. Also, I used 1/2 whole wheat and 1/2 all-purpose flour for the crust and it worked great. I loved this recipe. It was magical. I didn't have the plum tomatoes, but I just seeded and drained the ones that had grown last week, and it was delightful. I’ve never made a pie in my life (or biscuits) but your explanation made me try it. I had no pesto, but had two bunches of cilantro so I found several kinds online and combined them all into one. It had cilantro, lime juice, garlic, cayenne, olive oil, and I added toasted almonds, and parmesan. All I had for cheese was some sharp cheddar, and some parmesan. I found the crust very easy to make and had no problems (other than I can’t seem to make one round). Another change I made was to add some very crispy bacon in the layers. I came out delicious! Thanks for the post and the words of encouragement for the cooking challenged like me. By the way………my wife loved that I made the dinner and cleaned up the mess, so all she had to do was enjoy it.Looking forward to making it again by your original recipe!! I made your DELICIOUS Tomato-Pesto pie last night and we were thrilled with the results. It made no difference that as usual my dough did not come together when I rolled it out and I had to jigzaw the pieces together. I wonder if the butter being a little bit less than cold was the issue. I figured I should post this here too... Just FYI for everyone, I tried pre-assembling the pie a day ahead and it totally worked! Perhaps partly because the pesto was not very liquidy - I used your arugula pesto recipe but my brain crossed it with the basil pesto recipe and I "accidentally" added almonds. Maybe the thicker pesto helped the crust stay drier. Anyway, I just put it all together, covered with plastic wrap and stuck it in the fridge, and then pulled it out about an hour before cooking so that it could return to room temp. Thanks again for the great recipes and advice! I made this outstandingly delicious tomato pie last night for dinner, and my boyfriend told me I had to email you to say thank you for the recipe. He couldn't stop saying how delicious it was. I think he had some cold for breakfast this morning. I caught a suspicious whiff of pesto on his breath when he kissed me goodbye. I used tomatoes and basil from our garden...delicious! And the cheese in the crust was a stroke of genius. I'm thinking of making 2 more and freezing them as a way to use up our crazy crop of tomatoes. I found this last week and am planning to make this when I visit my parents this weekend. (it looks delicious!!) I decided to figure out how many calories this was and calculated about 3533 calories for the whole thing. So if you divide it into 8 pieces that's about 442 calories/piece. first of all, is 1/8th of this filling (I wanted to add a side dish of salad or veggies to this). secondly, what are some ways I could reduce the number of calories (use less mozarella, less romano cheese.. etc) or some substitutes to maybe make this about 300 -350 calories/ piece.. that way even if a person eats one and a half or two pieces its not too bad? I apologize for not getting back to you sooner. I'm afraid I don't quite understand your first question. As for reducing the number of calories in this recipe, yes, you could certainly use less cheese. You could also use lowfat or part skim mozzarella (I prefer whole milk). My pesto recipe is already much lower in calories than most (which often call for up to a full cup of olive oil), so I would recommend using it. You might be able to get away with reducing the butter in the crust by a Tablespoon or two. This looks FANTASTIC!!!! Can't wait to try it! My CSA newletter suggested a recipe of yours (not this one) so I decided to check out your site....what a find! I can tell I'm going to learn so much from you. My husband and I made this pesto pie last week from mostly fresh ingredients and it was amazing!! Thanks for the great recipes and the tips! i made this pie today and i loved it. the crust is wonderful, i think i'm going to make it many more times with different fillings. 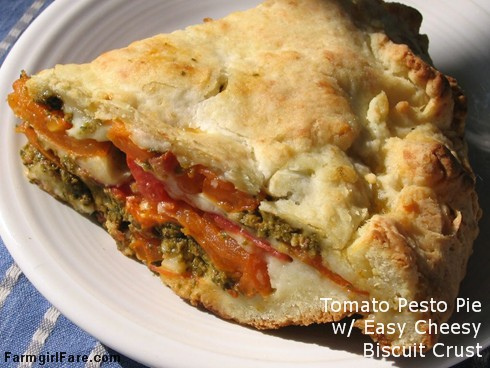 i liked the filling of pesto and tomatoes, too, but the crust is something i can't stop talking about. I made this last night for dinner, and my husband and I both loved it! I pretty much followed your pesto recipe, but used pine nuts instead of almonds b/c that's what I had. Also, I just tossed all the ingredients in a blender and whirled. It was fantastic leftover as breakfast with a side of bacon. Mmmm. Great site. Am excited to try some of your other recipes, especially the Italian sausage. This remains my favorite thing that I know how to make. I've shared the recipe so many times, always to rave reviews. Also, last week was the first time that I actually did let it sit for 15-20 min after coming out of the oven, and you're right! It keeps it from being soupy and the leftovers from being soggy! WHO KNEW! I guess it pays to follow directions. :) Anyway, this is basically the best recipe ever (esp with arugula/chickpea pesto). Thank you!! Oh, p.s. I'm a big fan of making the crust with half whole-wheat flour. I loved my little bakery cafe, which was successful from the very beginning. It had a lot of potential, but unfortunately I had to sell it due to health reasons.